Steve is still using paper/pen for his presentation points. And no Magic trackpad, old habits die hard/never, products are for the consumers only. are the points highlighted by Steve Jobs. Steve was proud about the new stores around the world. And he started to play some numbers game as usual. I guess Google was hurt by taking his stats in a wrong way. But the way I see, it is actually a sign of fear from Apple. Bug fixed, so Gizmodo should not babble about the proximity and bluetooth issues any more. Unfortunately Gizmodo was right and Apple acknowledges the issue once the fix is done. Come on nothing harm in accepting the truth. High Dynamic Range (HDR) photos: Pat Apple, this is GOOD really GOOD. You scored a PLUS here. Game center: It is not new for the iOS developer. It seems someone at Apple board meeting said crystalSDK is earning more. I hate killing startup by stealing their ideas/acquisition. I’ve no idea why they revealed their plan. Its good, frequent keynote events kills their show-off and expectation however there is nothing interesting now-a-days. I wish with next keynote they move on something really innovative not reinventing the same touch based devices again. Multitasking OOPS!! hibernation of apps for iPad will be available with this version. Hmm, Did Steve mention HDR coming to iPad this November?? Camera/Facetime is inevitable then. But now I’m really annoyed on thinking about taking picture with iPad rear camera? 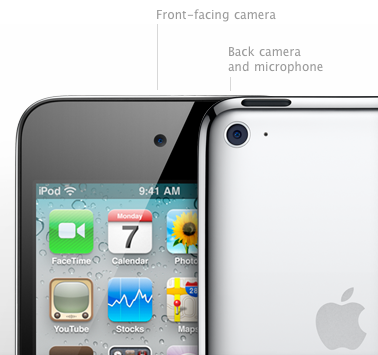 Though Steve revealed the hardware updates of iPod Touch last. Touch screen to iPod Nano was the only thing that impressed me. After Jobs explanation of evolution of iPod Nano, I just had only one question, Then why did you reduce the display area of Nano? Fonts are ugly, I’ve loved the smaller fonts of earlier version. Two-finger rotate gesture to change the orientation of display saved the need of accelerometer; I’ve liked it. No AppStore, Thanks Steve I very much appreciate it. Else another idiom added to UI_USER_INTERFACE_IDIOM() and conditional coding; pain for the developers. It was surprised to know iPod nano can tell you when battery needs charging. Well, I haven’t handled iPod nano earlier. 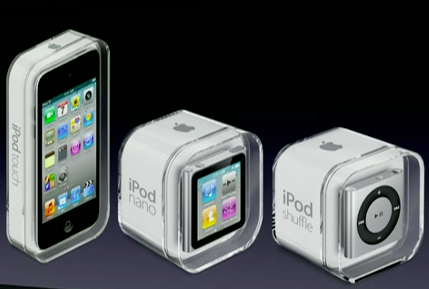 iPod nano: “46% smaller, 42% lighter - in other words it is almost half as small and half as size of its predecessors”. He was the one who referred “0.55% - Just one half of one percent”. You get the idea? Data never lie, how you interpret it matters. I haven’t found any details about the FaceTime. Apple site says “FaceTime works right out of the box — just enter your Apple ID and email address” I wish they don’t ask for a MobileMe a/c. Free version of Gmail/Google Accounts is greater than anything out there in the cloud. We’ll consider if there is a free MobileMe a/c. They have said FaceTime is going to be open source and I haven’t come across any documents on how to integrate with our own app. There is an evil restriction: You can take only 960x720 pic with rear camera which is capable of full 720p(1280x720) HD video 30 fps. Shame on you, unless there is a valid technical explanation. No LED flash: It wasn’t discussed in the video. I wonder why? the hole next to rear camera seems to be a mic. I just wonder how HOT would it be with all the features in small space? Okay its only winter ahead.